History continues to be one of our favorite subjects to study at home so having the opportunity to review Drive Thru History®’s newest addition, Drive Thru History® “Acts to Revelation” is an exciting opportunity. Exploring New Testament history and geography right along with host Dave Slotts. Drive Thru History® is a video series where the host, Dave Slotts, takes driving tours through locations where major historical events have taken place. His commentary throughout provides extra information on the geographical locations, historical significance, and some interesting tid-bits along the way. His personality and humor make it engaging for all audiences, especially since Dave always seems to be enjoying himself every step of the way. There are five Drive Thru History® series available: Ancient History, American History, Holy Land, “The Gospels,” and now “Acts to Revelation” You can read our review of “The Gospels” here. 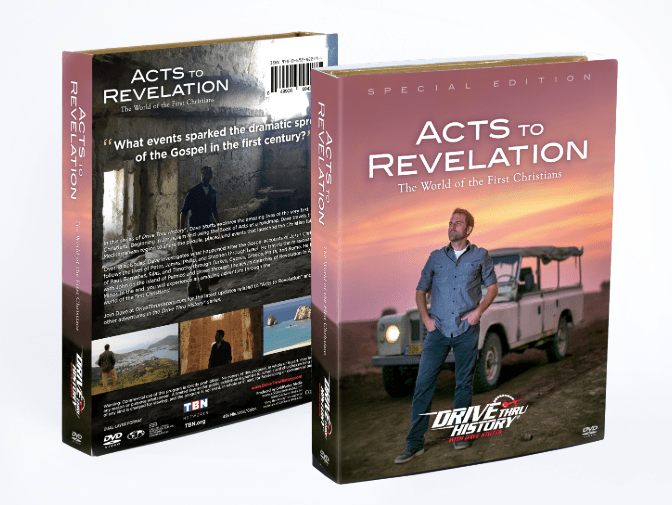 Drive Thru History® “Acts to Revelation” series is composed of 18 30-minute video episodes. It begins when Jesus ascends to heaven, giving the disciples the Great Commission. The road trip begins in Jerusalem at Pentecost. It goes through the growth of the church and the spreading of the Gospel, as chronicled by Luke in the book of Acts. Dave shows archeological finds that support Luke. Dave also shares historical backgrounds and cultural information regarding the places that Dave visits on his tour. On the trip, Dave visits places like: Jerusalem, Joppa, Caesarea, Antioch, Philippi, Ephesus, Rome, Athens, and Colossae to name a few. His drive covers 6 countries. Dave visits the modern cities that continue the history today such as Tel Aviv and Jaffa. The beautiful history, scenery, and settings of the events of Acts through Revelations highlights the letters and preachings of Paul and the rest of the apostles. Dave even visits the cities of the seven churches mentioned in John’s Revelation. We thought that the scenery was amazing as Dave drives through these amazing Biblically historical locations. Additionally, as the episodes show quoted Bible text and historical documents, the background images were sometimes paintings and artwork capturing the time or story. Additionally, graphics or animated images of the buildings and/or cities as they would have appeared during the first century were included. Maps are shown throughout, which were also fascinating. The Drive Thru History® “Acts to Revelation”3-DVD set comes encased in a hardcover book which includes a study and discussion guide. This is great for small group use or a homeschool. The Study Guide book is the DVD case and printed in full color. For each episode there is a title page with a photo and scripture passage, a summary page of Dave’s travels in the episode, a short set of discussion questions and suggested scripture readings as well as some extra information relating to the episode. There is also a full color two-page photo of one of the sites visits. All the answers to the discussion questions are included at the back of the book. We watched theDrive Thru History® episodes as a family. Some held my little kids better than others. My son is a HUGE history fan so he really liked most of it, especially the pictures of how the places would have looked and the map. He is a map kid! My older daughter liked the study and said it really was helping her in her Sunday School Bible study of the New Testament. My husband and I both really enjoyed it all. Having visited some of the places recently, we enjoyed seeing them and learning a little more. We both wished we had watched it before going to see them in person. Seeing the places that we have read about and studied over the years, makes the scriptures simply come alive and brings excitement and depth to the stories. Overall we really liked the series. Dave always adds some fun and humor to the episodes as well as piling on the facts and historical value. I would definitely recommend this for anyone wanting to further their own personal study of the New Testament or for families with older children as a family study. Be sure to check out want the rest of the Homeschool Review Crew had to say about Drive Thru History® and “Acts to Revelation” by clicking the banner below. Read our review of Drive Thru History® The Gospels and check out Drive Thru History® on social media.